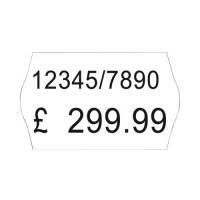 Avery Price Marking Label Single-Line White Roll of 1500 Peelable Pack of 10 "Avery Labels for Hand Labeller. 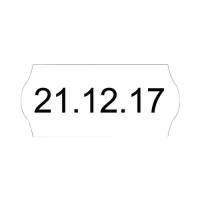 Quality self adhesive labels. Suitable for the Avery 1/16 and 1/8 guns. 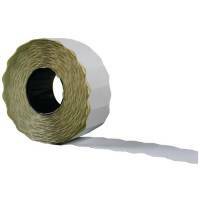 12x26mm, 1500 labels per roll and there are 10 rolls per pack. White peelable." "Avery White Two-Line Price Marking Label Roll (Pack of 12,000) WR1626" Pack of 10 "Quality self adhesive labels suitable for Avery 2/16 gun. 16x26mm, 1200 labels per roll and there are 10 rolls per pack. White peelable." 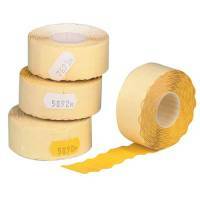 Avery Price Marking Label Single-Line Yellow Roll of 1500 Peelable Pack of 10 "Quality self adhesive labels. Suitable for the Avery 1/8 and 1/6 hand labellers. 12mmx26mm, 1500 labels per roll. Each box contains a free ink roller. Yellow peelable pack 10, 10 rolls per pack." Avery 2-Line Label Permanent White WP1626 Pack of 10 "Permanent adhesive labels for use with the Avery HL0018 hand labelling gun. Printable 2 lines, 1,200 Labels per roll. White with security cuts to prevent ticket switching. 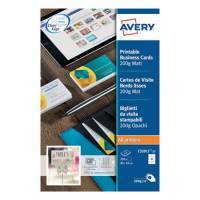 16 x 26mm"
Avery Matte White Double Sided Inkjet Business Cards 85 x 54mm Pack of 200 C32015-25 Pack of 1 Avery Quick and Clean Inkjet Matt Coated Business Cards. Design and print your own 85 x 54mm business cards. 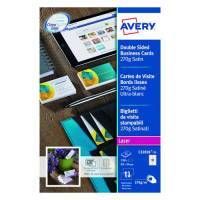 Avery Matte White Multipurpose Business Cards 85 x 54mm Pack of 250 C32011-25 Pack of 1 Avery Quick and Clean Laser Business Cards with no perforations separation. 85 x 54mm. 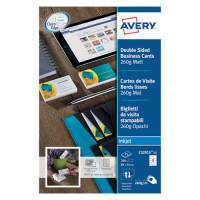 Avery Satin White Double Sided Laser Business Cards 85 x 54mm 220gsm Pack of 250 C32016-25 Pack of 1 Design and print your own professional looking business cards from your laser printer. 220gsm heavyweight card. 10 cards per sheet. 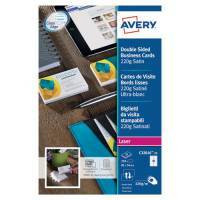 Avery Satin White Double Sided Laser Business Cards 85 x 54mm 270gsm Pack of 250 C32026-25 Pack of 1 Avery double sided heavyweight business cards for use in colour laser printers. Quick and Clean technology for quick separation of cards. perfectly smooth edges with no card curl after separation. Card size 85 x 54mm. 10 per sheet. Satin white. "Avery White 1-line Permanent Labels (Pack of 15,000) WP1226" Pack of 10 "Permanent adhesive labels for use with the Avery HL0018 hand labelling gun. Printable 1 line, 1,500 Labels per roll. White with security cuts to prevent ticket switching. 12 x 26mm."